This is the second largest garden show in North America and one of the premier garden events on the continent – held in the Washington Convention Centre in downtown Seattle. There are over 6 acres of display gardens and hundreds of displays, free seminars and demonstrations. 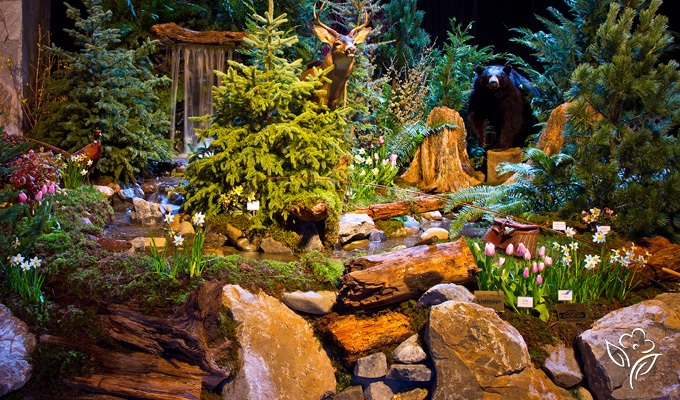 Google Northwest Flower and Garden Show to see details and video. When – Wednesday Feb. 5 and Thursday Feb. 6. The show runs from Wed. to Sunday, but I am proposing we go on the Wednesday and Thursday. There will be less crowds, the displays are fresher and everyone over 65 can still travel for free on the ferries. Wednesday Feb. 5 – catch 10:15AM ferry from Duke Pt., arrive Tsawwassen 12:15. Drive to Seattle, arrive about 3:15PM. Check into hotel. Go to Garden show on 1/2 day pass. Show is open to 8 PM. Dine out in Seattle or food is also available at the show. Overnight at Sheraton Hotel, across the street from convention centre. Thursday, Feb. 6 – breakfast and check-out. Back to garden show for a day of taking in the sights and seminars. Leave Seattle at about 4PM. Arrive at Tsawwassen about 7 PM. Dine haute cuisine at the ferry terminal, catch the 8:15 ferry back to Duke Point. Arrive at 10:15, snug in bed in Ladysmith by 11 PM. accommodation – Sheraton Hotel – $133 for a double – about $70 per person with tip NOTE – you will book your own hotel room. Go through the Garden Show website to get this rate. Ask to be near the Ladysmith garden club group. $17 for full day on Thursday – this is the “early bird” rate – buy this ticket on-line through the Garden Show website. Full day tickets are $22 at the door. Total costs – about $170 plus food. In the US you will be paying in US dollars. I’m assuming the exchange rate will stay about where it is now. Staying one night only and going via Tsawwassen keeps the costs as low as possible. There will be a sign-up sheet for those interested at the next meeting. Otherwise contact Pam Fraser at pfraserpg@shaw.ca or 250 245-3543.